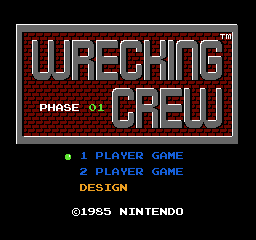 In Wrecking Crew, Mario begins his new career as a construction worker, only to find the job description didn't mention evading monsters. In Japan, the Famicom version allowed players to save their level designs to an audio cassette tape through an accessory called the Famicom Data Recorder. This accessory was never released outside of Japan, so non-Japanese players couldn't save their level designs, despite the manual promising that development was underway on a method of doing so. The Virtual Console version allows players of any region to save their level data internally, without the need for an accessory. This page was last modified on 1 July 2015, at 09:27.